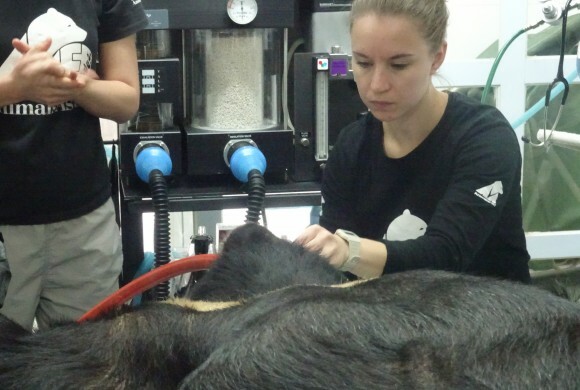 There wasn’t a dry eye in the operating theatre, as we watched the Chengdu sanctuary ‘s vet and two nurses perform a two-yearly health check on one of the 600 plus bears already rescued by Animals Asia from bear bile farms across China and Vietnam. 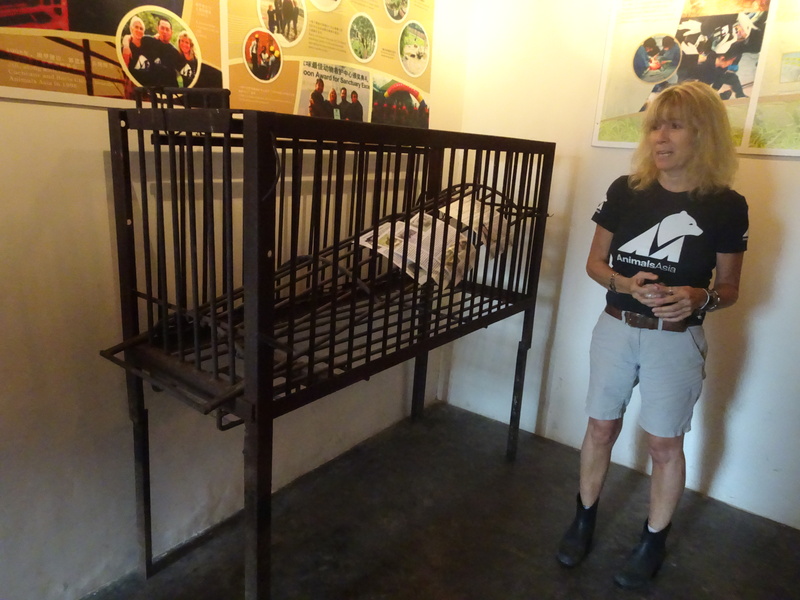 We had been invited by Jill Robinson, founder and CEO of Animals Asia to witness first-hand, the reason why we had trekked the Great Wall of China for 5 days raising funds and awareness for the charity. Listening to Jill explain the procedures about to take place on this huge fluffy, healthy looking 214kg sleeping bear, it was hard to believe he had suffered so much, and for myself personally, all the challenges I had faced during the trek seemed to pale into insignificance. Jill explains about the crush cages. 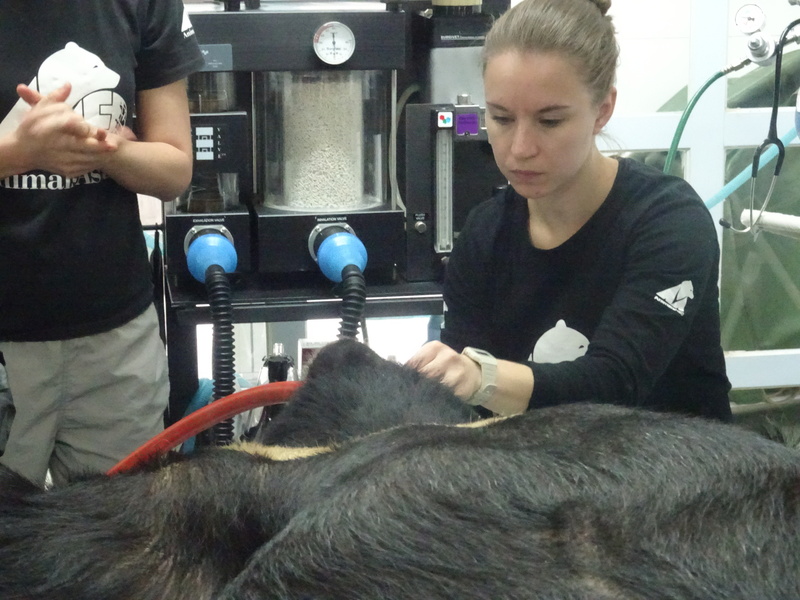 Asian black bears existing on bear bile farms must endure the cruellest of cruelties man can bestow on any other living being. More commonly known as Moon bears, because of their moon shaped crescent across their chests, they can live up to thirty years kept in the tiniest of cages to extract their bile, largely for medicinal purposes. 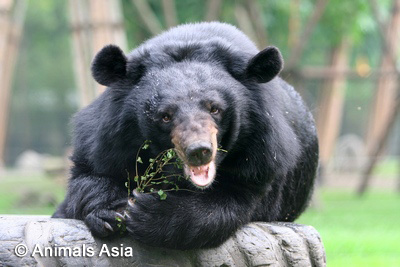 Some cages in China are so small the bears are unable to turn around, or stand on all fours. Starved and dehydrated, many of the bears suffer from multiple diseases and malignant tumours that ultimately kill them. 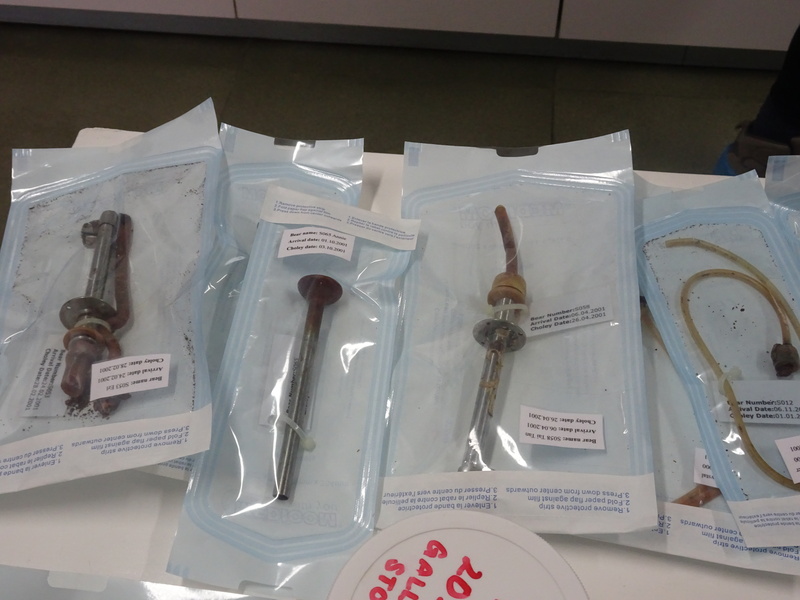 The various techniques used to extract the bile from the bears are painful and invasive, causing massive infections for these innocent creatures. Jill and the team are making huge inroads in bringing about an end to this barbaric practise, but even with effective and affordable herbal and synthetic equivalents becoming more readily available, there are still 10,000 bears – mainly moon bears, but also sun bears and brown bears kept on bile farms in China and 1,200 in Vietnam. 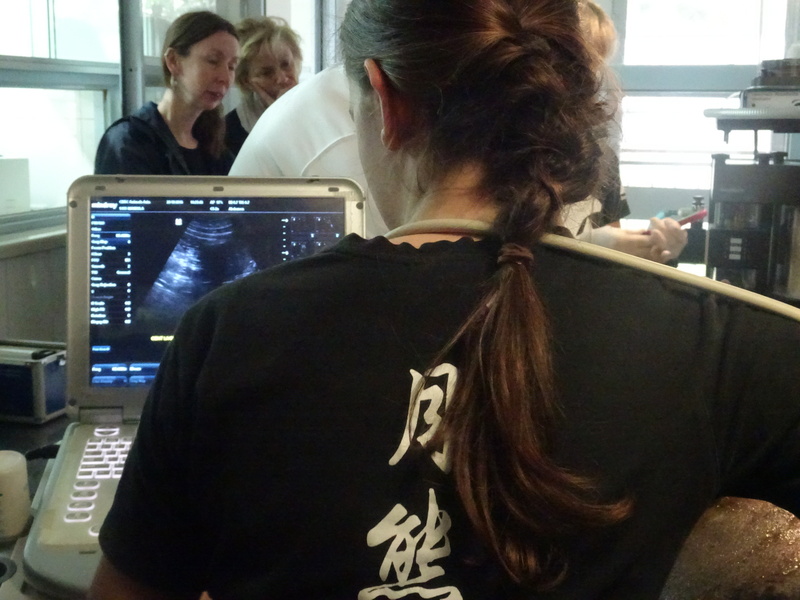 Mandela, named by Dr Jane Goodall, breathed quietly and slowly under the anaesthetic, whilst the medical team conducted an abdominal ultra sound, eye, dental and joint examinations. 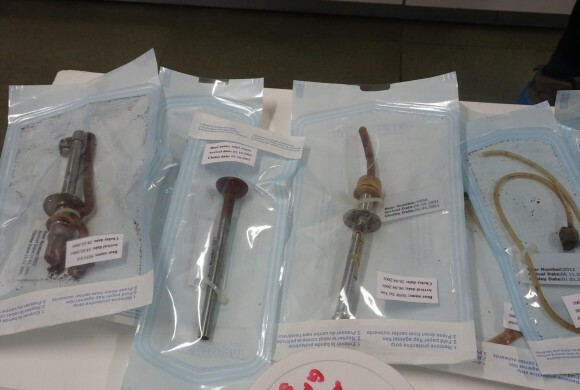 The vet and nurses could breathe a sigh of relief, because other than his arthritic hip and joints, which he was already being treated for, nothing sinister had been picked up during the tests. It’s during these crucial health checks the medical team can observe heart breaking abnormalities, such as tumours, which due to the bear’s harrowing past can progress very rapidly. The outpouring of love throughout the theatre that morning, hopefully consumed every inch of this beautiful bear’s torso. The remorse we felt on behalf of some of humanity’s ignorance and disrespect towards the emotions of other sentient beings, and the apologies we showered him for the horrific pain and suffering he had endured must have surely penetrated his soul. Mandela, who is known as the ‘foodie’ of the sanctuary, had been rescued in December 2005 from Zhi Yang Bear Farm and like nearly all the bears, his gall bladder was removed almost instantly in January 2006. The start of a new journey for him and now 11 years later through Animals Asia’s team efforts, compassion and kindness and his strength of character and forgiveness, he is testament to what this charity accomplishes time and time again with our help. 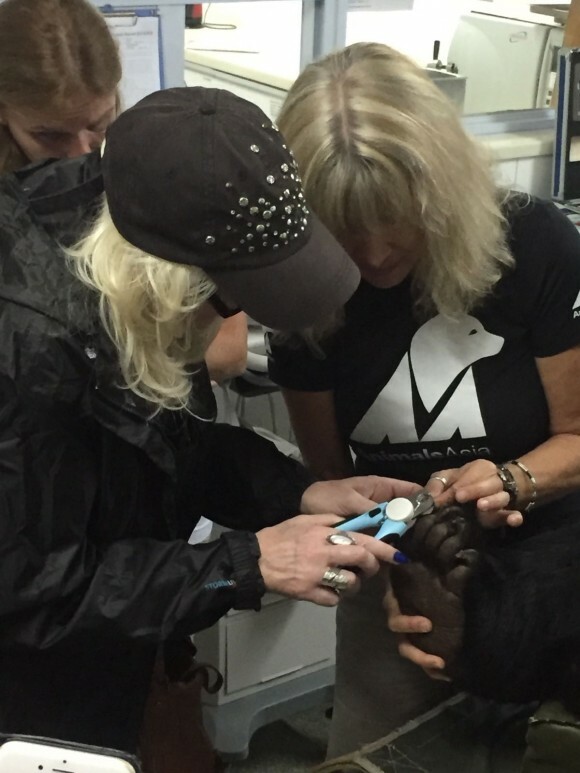 Helping Jill to trim Mandela’s claws. Completely broken in both body and mind when rescued, it doesn’t seem possible that these beautiful bears lives can be restored, but what I witnessed during my two days at the Chengdu Sanctuary gave clear evidence to the contrary. They had been given back their dignity, their self respect, but most of all they were living a peaceful, happy existence, free from fear.